In 2009, the two-volume manga miniseries Hoshi Mamoru Inu by Murakami Takashi not only became a recommended work at the 12th Japan Arts Festival; it also ended up on various top ten lists in literary magazines all over Japan. Now, screenwriter Hashimoto Hiroshi (One Piece anime series, Cheer Cheer Cheer) and director Takimoto Tomoyuki (Ikigami) bring the touching story of a man’s final journey with his loyal dog to the big screen. 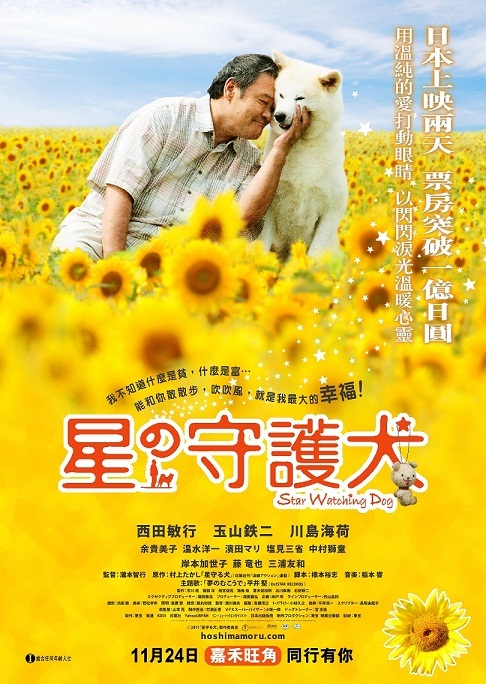 Filmed across northeastern Japan, Star Watching Dog stars Nishida Toshiyuki (The Magic Hour) as the terminally ill man and Tamayama Tetsuji (Norwegian Wood) as the caseworker who retraces the man’s journey. In rural Hokkaido, the body of an elderly man and a dog that died five months later are discovered in an abandoned car. The incident’s caseworker Kyosuke (Tamayama Tetsuji) finds several receipts with a Tokyo address next to the man and becomes curious how the man got there and why his dog stayed beside him for so long. With a teen girl as his assistant, Kyosuke retraces the story of Pops (Nishida Toshiyuki), a man suffering from illnesses and personal tragedies who left his home in Tokyo with his beloved dog Happy. Along the way, Kyosuke also begins to remember his time as a child with his own dog and understands the value of a man’s best friend.